The statue is 45-feet high and made entirely from bamboo procured locally as well as from Myanmar. 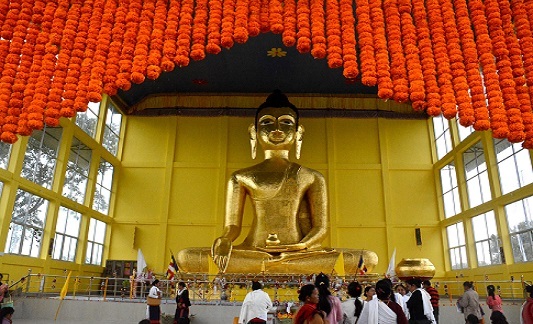 World’s tallest Buddha statue made from bamboo was unveiled at Tengapani in Namsai district of Arunachal Pradesh. The statue is 45-feet high and made entirely from bamboo procured locally as well as from Myanmar. A team of 50-member artists from Myanmar worked for around two years to complete the statue which has been donated by Arunachal Pradesh MLA Chow Tewa Mein. The three-day ceremony began on Wednesday and will conclude on Friday. The main monk for the ceremony has come from Myanmar. Donor Chow Tewa Mein said the bamboo used for making the statue has been treated in such a way that it will last more than 500 years. Apart from the statue the campus also has a huge meditation centre. Mein said apart from spiritual tourism he also wants to develop the locality into a eco-tourism centre.